BEFORE: This is day two of my run of Al Pacino movies. 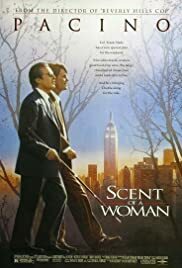 With a total of eight Academy Award nominations, Pacino’s only win comes with his performance in Scent of a Woman. AFTER: Even as a blind man, a role very atypical for Pacino, he pulls it off. One of my favorite scenes in the movie is when Lt. Col. Slade (Pacino) is able to talk his way out of a speeding ticket. From beginning to end, Scent of a Woman is full of little scenes like this that make you appreciate the work Pacino does. More importantly is the path this film follows. It starts out strong but about halfway though, I was left wondering, “Alright, now where is this going to go? The story seems likes it’s wrapping up and there’s over an hour left.” Let’s just say the ending was well worth the two and a half hour wait. The speech given by Slade is one of the best speeches I’ve heard and leaves the film on an extremely high note.